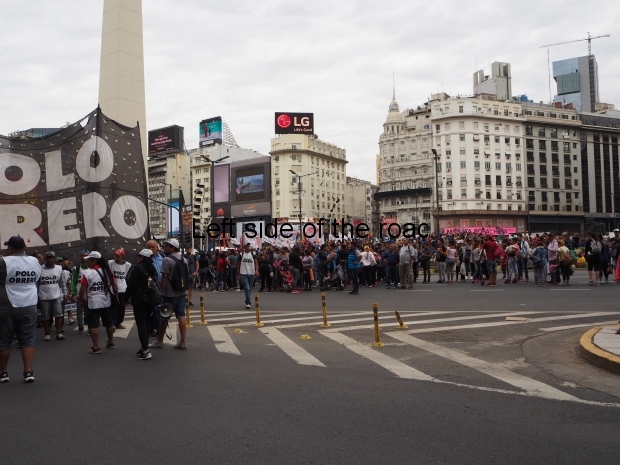 I was lucky on my first Monday morning in Buenos Aires/Argentina. I was looking for a shop to get a local SIM card. 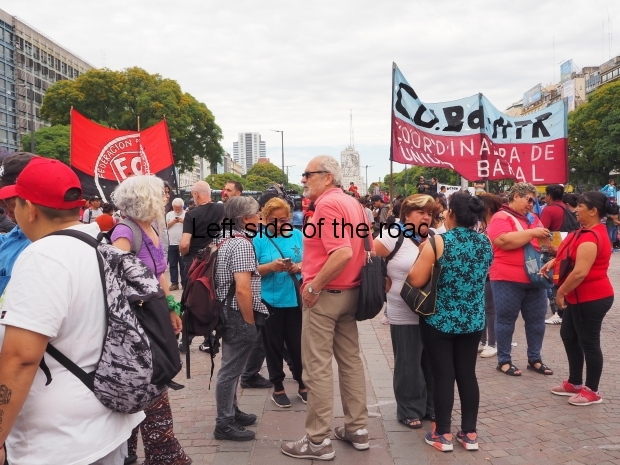 I didn’t find the place I was looking for but in the process came across people congregating for a demonstration – or was it two? 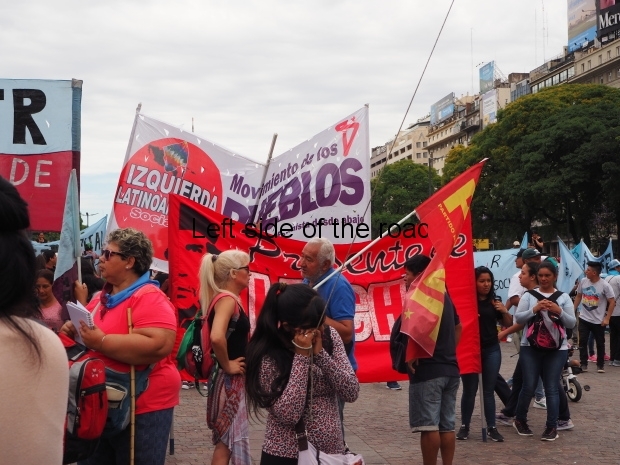 It seems that the little garden area to the south of the Obelisk, on Avenida 9 de Julio, in the central part of Buenos Aires is the traditional starting place for workers’ demonstrations. Arriving at that part of the city at around 11.00 on Monday 26th November 2018 I noticed a number of banners and went to investigate. 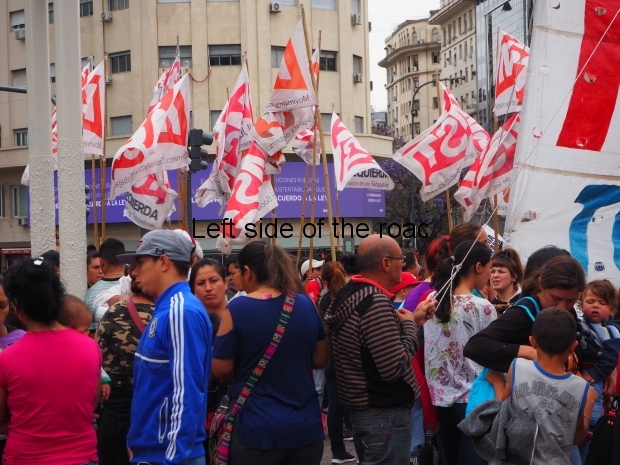 It was immediately obvious that this was a left-wing, anti-government gathering. 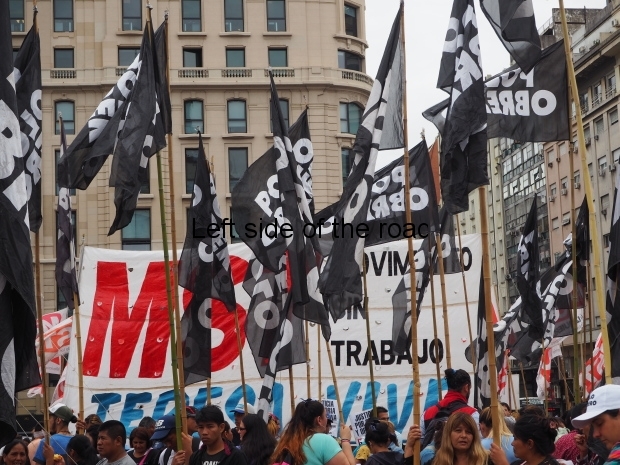 The first banner I saw was one of the MST (Movimiento Sin Trabajo – Unemployed Workers Movement) but this was still in the early stages of people arriving and others were in the process of fixing their banners to their carrying poles. 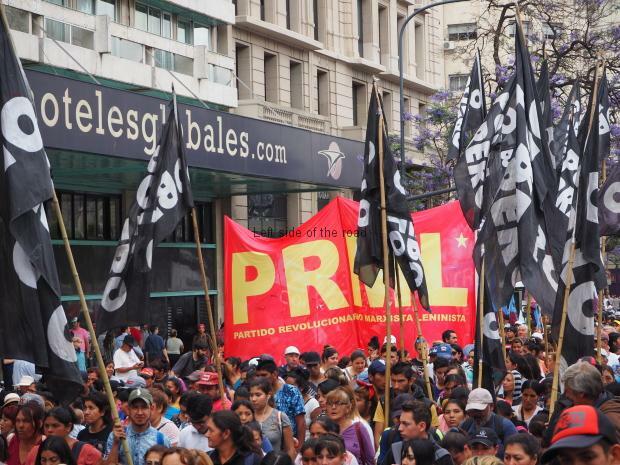 In various Latin American countries there’s a form of displaying your banners and statements which is nation specific. 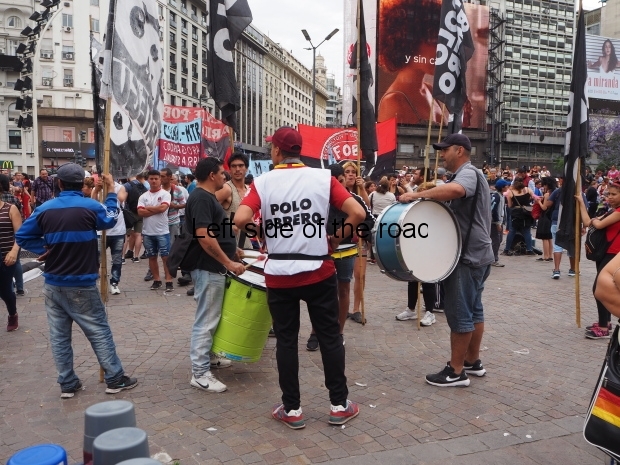 Many countries don’t use poles at all and the banner is carried in the hands of the supporters. 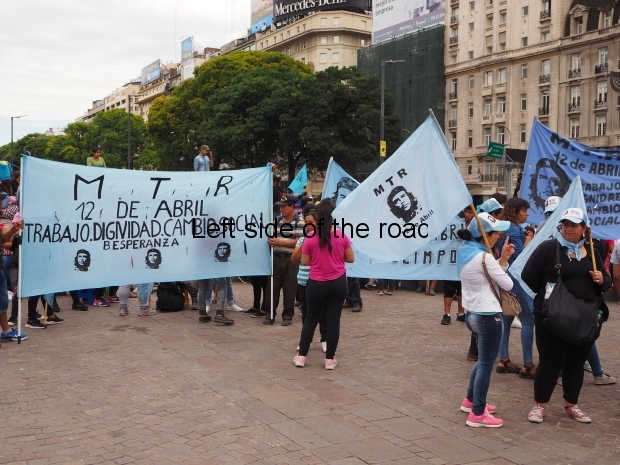 In many ways these banners are not designed to be preserved but address a particular issue. 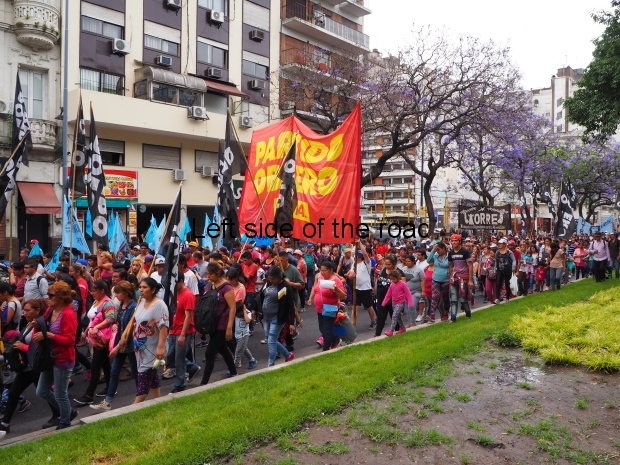 Here in Argentina they seem to go closer to what was the British tradition. 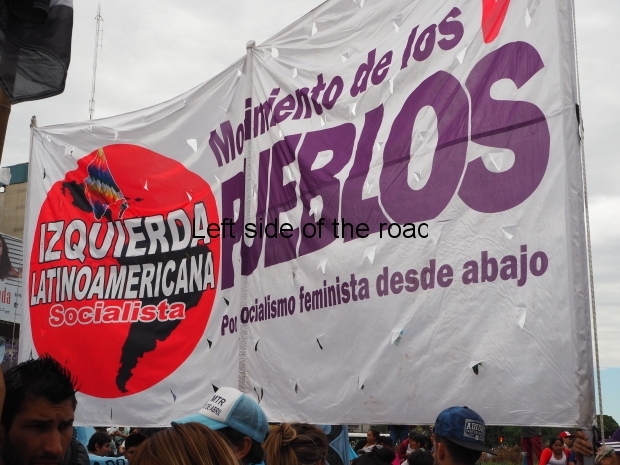 That’s having a distinctive and long-term banner which indicates who the organisation is that is supporting the aims of the march. Whilst not being as ornate as some of the Trade Union Banners that used to be paraded through the streets of various cities and towns of Britain (many of which, with factory and whole industry closures many of these are now only seen in the museum context of the People’s History Museum in Manchester) some of the banners had had significant time and effort expended upon their creation. There was a variety of Party Political banners (not all of their political allegiance I could work out) but also a number of very local neighbourhood (barrio) banners. 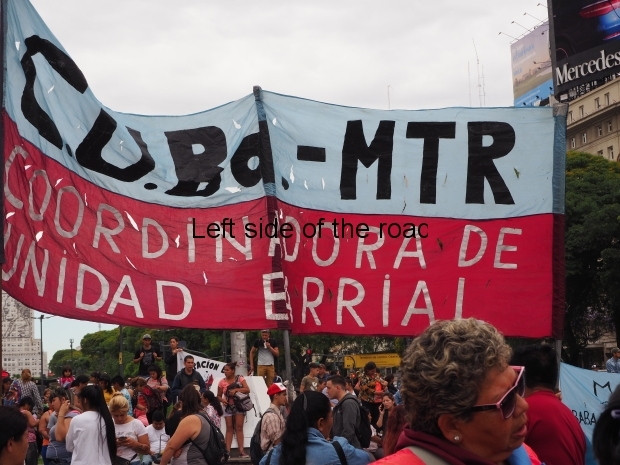 I liked that approach, in a way, as it was good that people are demonstrating in a way that shows solidarity based on where they lived. Trade Unions having been attacked and seriously challenged in all countries for various reasons what the working class needs are organisations which bring people together with something in common. ‘Issue politics’, which is becoming dominant throughout the world divides us rather than unites us. Where the working class live is still a positive uniting and organisation positive. As we got closer to midday more and more people started to arrive. This demonstration was not going to be damp squib. But at that time I didn’t know of the strange situation that existed, but which all those there did. 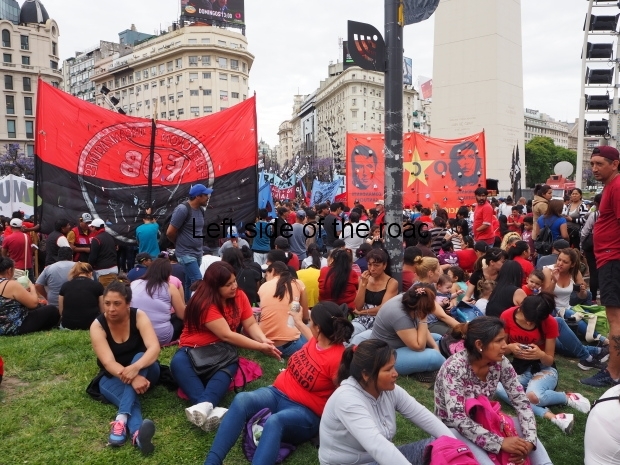 One matter that struck me as I walked amongst this crowd (which had a higher presence of women than most of the demonstrations I have been on) was that this was not a representative selection of people from Argentinian society. 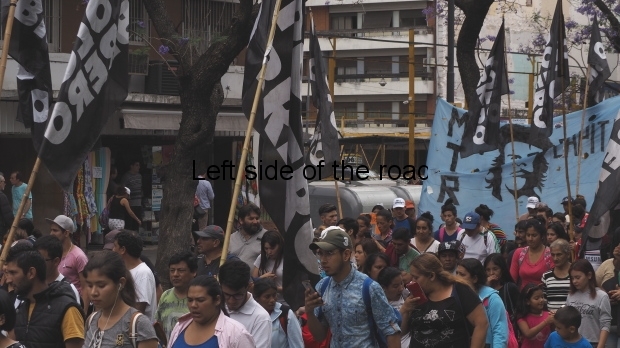 I’ve only been here for a few days but on the streets there’s a mix of people from those with European features to those whose roots are obviously from a pre-Columbian culture. The latter tend to be shorter and with a darker complexion. 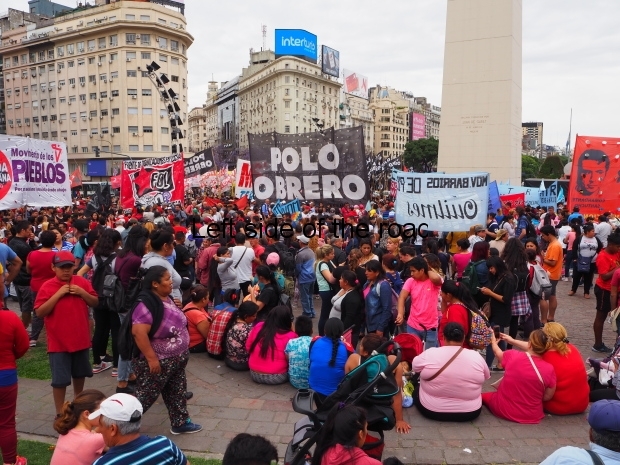 The overwhelming features of the crowd congregating close to the Obelisk were with an indigenous background. This is not really surprising. Throughout Latin America those with roots pre-Hispanic invasion are lucky to have survived. Those who have will almost invariably get the dirty end of the stick. 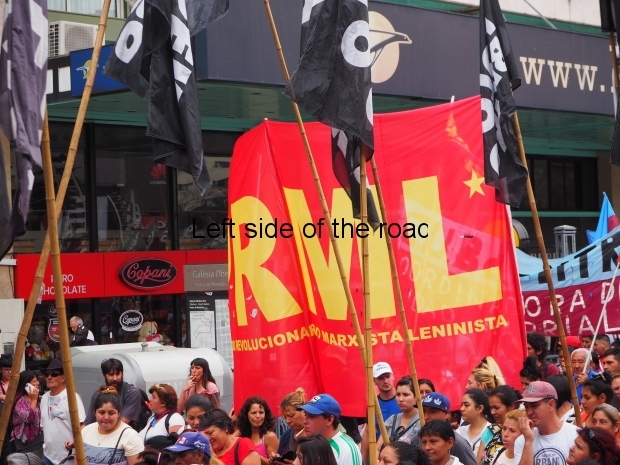 Racism is as rife in Latin America as in other parts of the world. 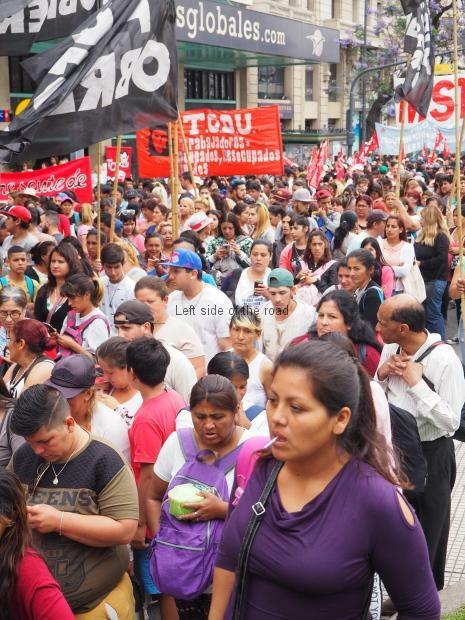 This ‘racial divide’ indicates that Argentina still has some way to go if the workers want to face the severe situation that is worsening by the day. What was surprising, and disappointing, when I had the chance to think about my chance experience, was the lack of any organised, working class, trade union presence at this gathering. If they were there then I didn’t see them and there were certainly no work related banners. 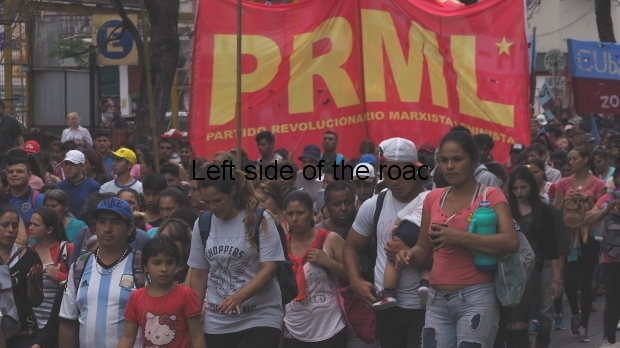 Organised labour was absent and that has obvious serious consequences for any struggle. It just demonstrates the effectiveness of the ruling class in being able to divert any struggle into a local matter (however important) rather than confront issues from a class standpoint. This ‘neighbourhood environment, however, did have its positives. 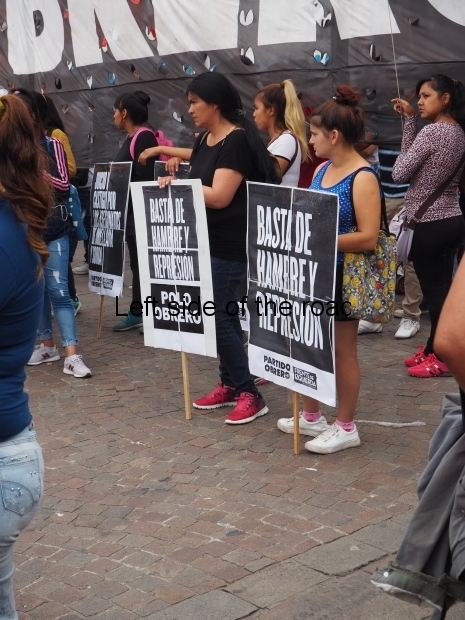 There was evidence that the ‘barrios’ had organised food for the people who had come to the demonstration. 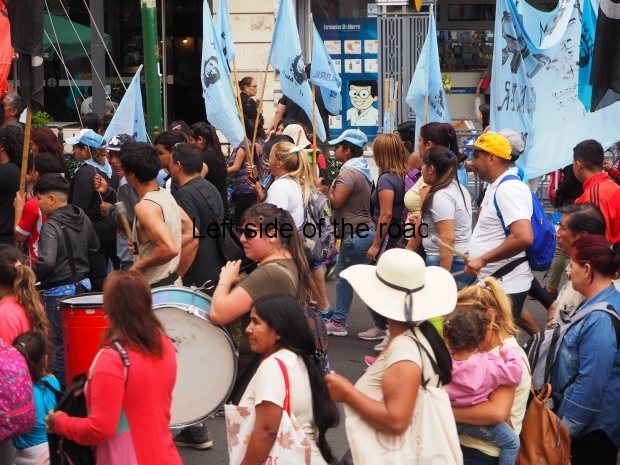 Some of them marched as a group to the meeting place, together with their drummers. As a foreigner I could see that people wanted to be with those they knew, their neighbours and friends. 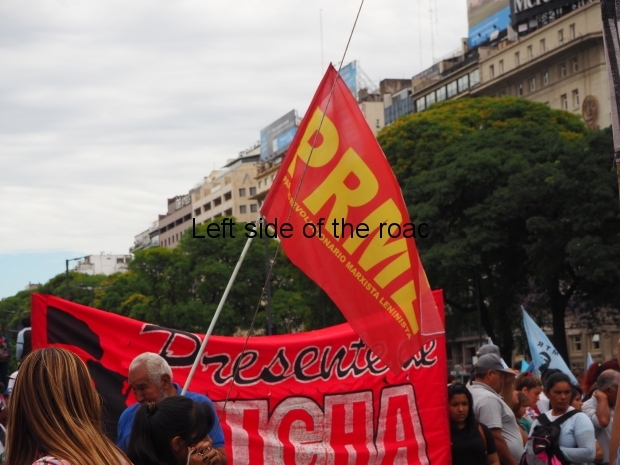 The jockeying for places was something I’ve never seen in the many demonstrations I’ve been on in my political life. 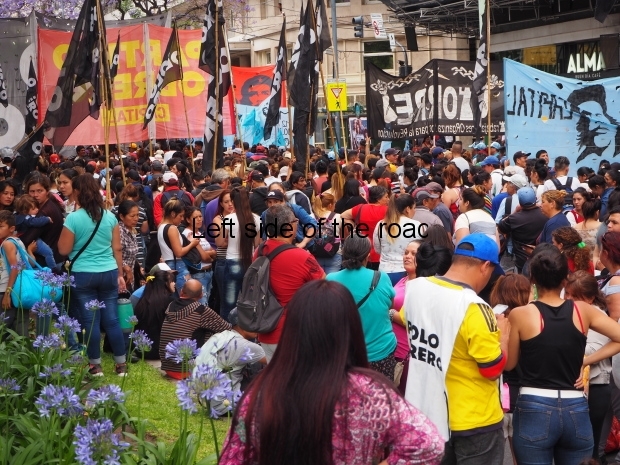 Without any announcement, at least which I heard, at 12.00 a section of the crowd moved away from the garden in the middle of what I understand is supposed to be the widest road in the world and started to form up at one of the slip roads. 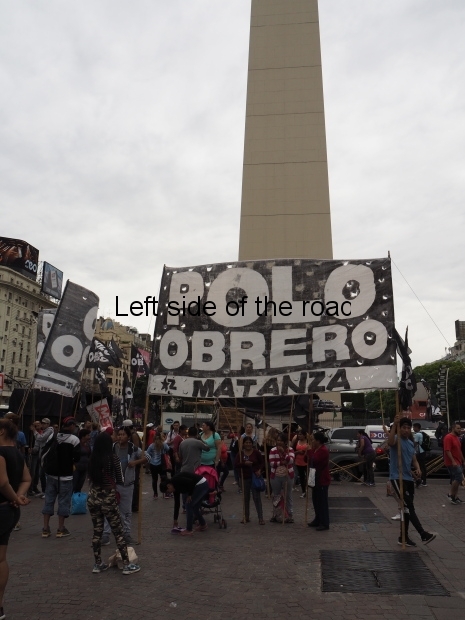 But I should be giving an explanation of why this demonstration was taking place at all, To the best of my knowledge it was a reaction to the murder of a 36 year old activist, Rodrigo Orellana, who was involved in the occupation of a piece of empty land in an area to the south of Buenos Aires. He was shot in the back by the police very early in the morning of Thursday 22nd November. 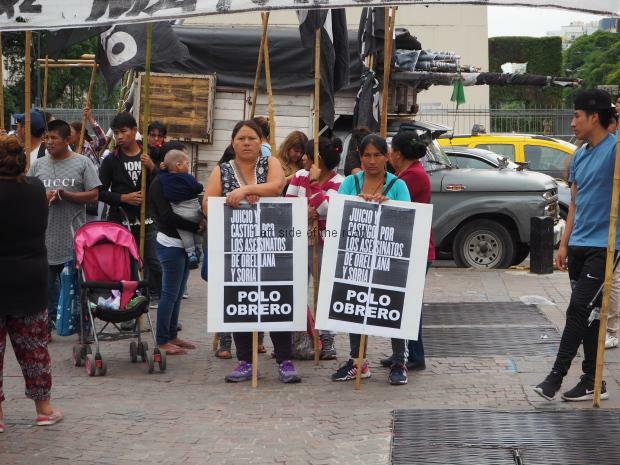 Another activist, Marcos Jesus Soria was killed by police in Cordoba last Saturday. 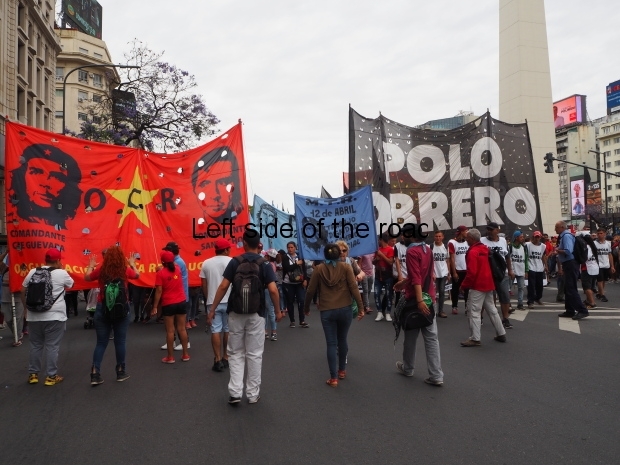 There were other issues, there always are, in a time when the working class throughout the world are still paying the cost of the last capitalist crisis with the next one only around the corner, but Rodrigo’s and Marcos’s murders seems to have been the main reason for the calling of this demonstration, when the week itself was full of events due to the G20 meeting. If I have read the situation correctly it was very impressive that so many people could have been called out onto the streets in such a short space of time. Up to now there had been no obvious police presence. That changed when the first part of the demonstration moved away from the garden and onto the road. 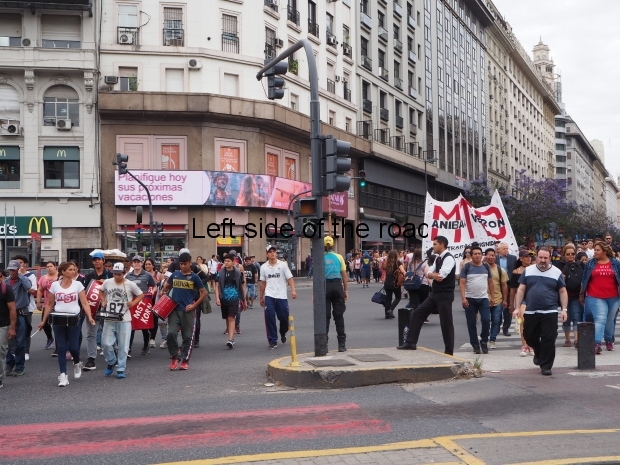 At first I was pleased that so many people were on the streets and would cause traffic chaos. 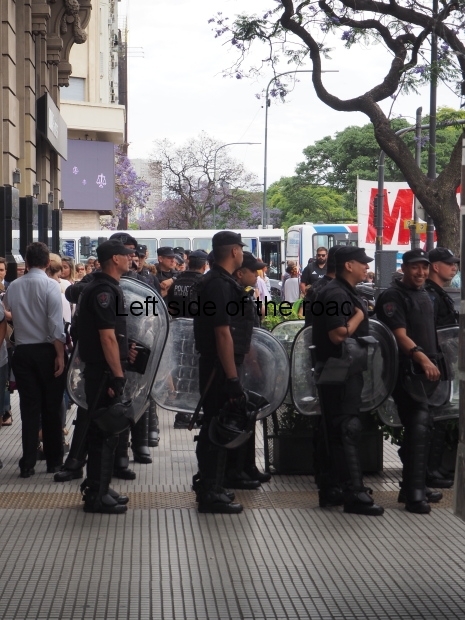 But however many people were there it was all controlled by a couple of motorcycle, city police who were at the front of the march. The hundreds, thousands, of people who were on to the road would only be allowed to cross an intersection if the chaos of people blocking junctions could be minimised. For reasons that make no sense, other than making a statement that the state is always ready to stand up against any workers manifestation of defiance, at the very place where the head of the march formed up, a contingent of about 30 riot police, with all their ‘necessary’ equipment were standing on the pavement, letting the demonstrators (many of whom were with very young children) know who was really in control. 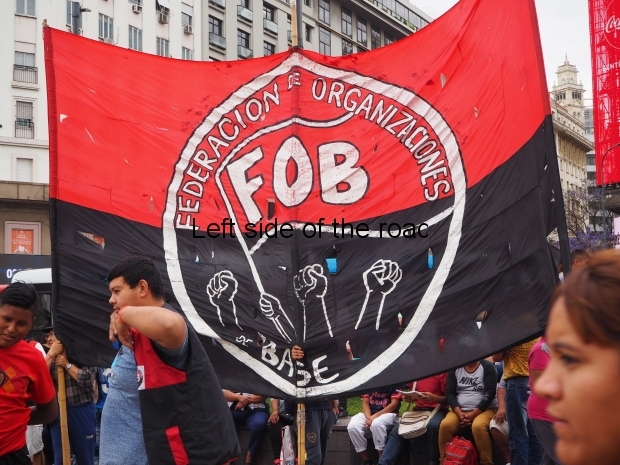 These miserable lapdogs of the ruling class are a carbuncle on society – in whatever country they might appear – and a rational approach to how to deal with them is something that should be in the thoughts of all revolutionaries. 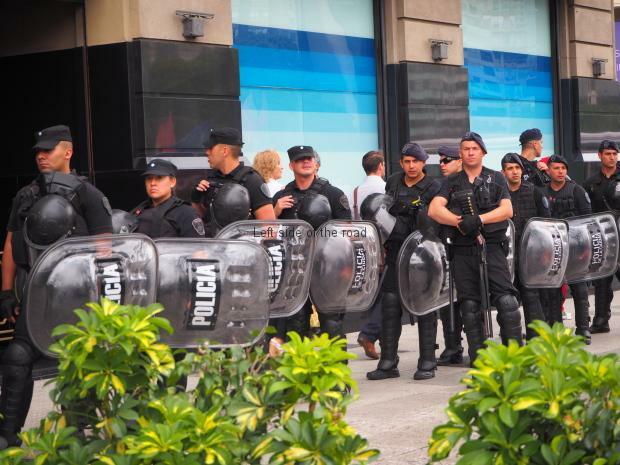 As a demonstration of female inclusiveness there was one woman, at least, in this group of state-sponsored and armed thugs. 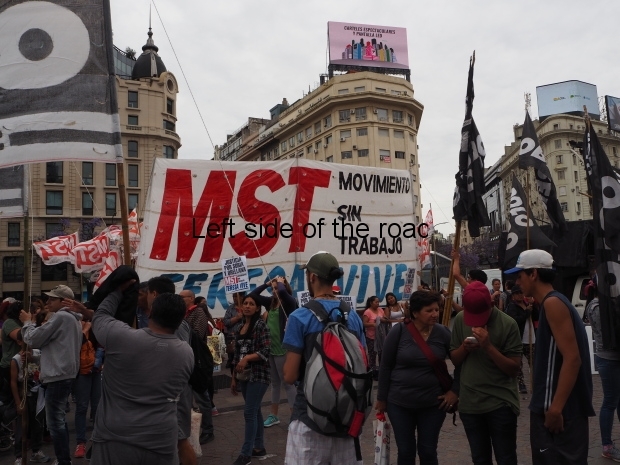 Slowly more people joined the others on the road and the area around the garden started to empty out and eventually the MST banner mentioned above was at the rear. 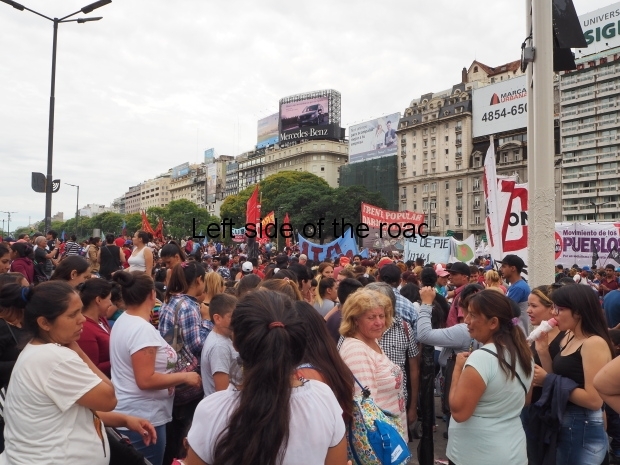 For some reason there appeared to be some hesitation to move off but when it did I was bemused to see that there were still hundreds of people, and a not inconsiderable number of banners still by the Obelisk – and there was no sign that they were going to move. All kinds of thoughts came through my mind. 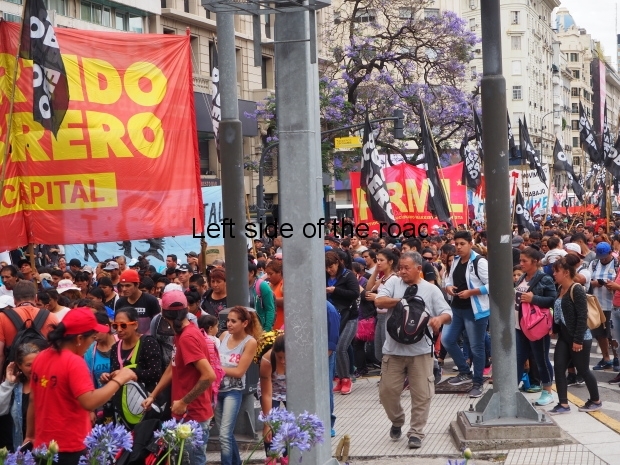 Was there some sort of political schism that I was unaware of and there had been a decision to split the march? I certainly hadn’t been aware of any animosity when I was mingling with the crowd. I just couldn’t work it out. 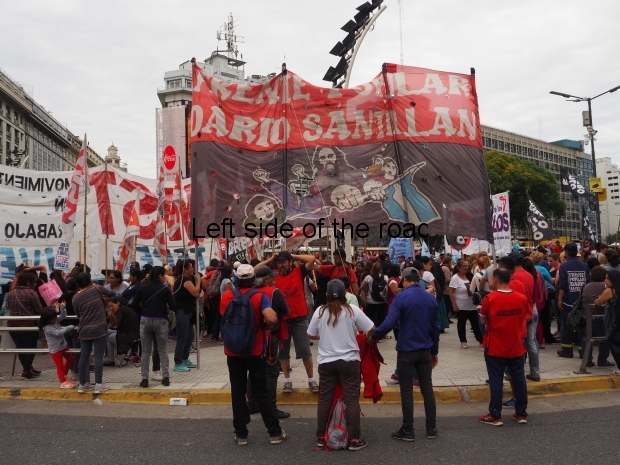 I followed the march for a few blocks to just before it turned right off the main avenue, heading in the direction of the Congress Building only a few more blocks away. I didn’t know what to do. I would have liked to have seen the march to its end but wanted to try to find out the reason why those who had not joined the march did so. Arriving back at the meeting point it was soon obvious that this was very much a neighbourhood event (ALL the banners were displaying that fact) as speakers were making their thoughts known. However, the PA system was far too inadequate for any but those really close to the speakers to be able to hear anything. Being at a busy traffic intersection didn’t help. This rally was also about deaths at the hands of the authorities and probably had been planned for some time – the reason that two separate demonstrations were taking place at the same time. 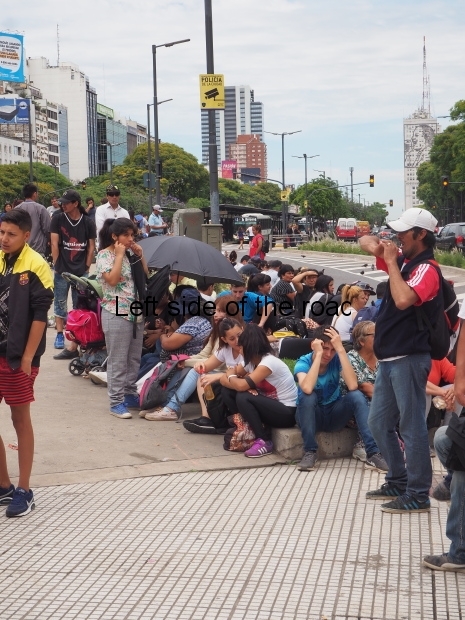 I don’t know if that rally was to later go on the streets and make their feelings known at a government building as the rally seemed to be going on forever and there was no sign of movement. Later that evening, reading a newspaper in a bar, a lot of my questions were answered – even more so the next day when the big demo that had moved towards the Congress Building was reported in Tuesday’s papers. I didn’t see any mention of the rally. I can see that there might have been a desire on behalf of the organisers and supporters of this neighbourhood rally to have their case separate, in the hope of giving the issue more publicity but I don’t really understand why some effort wasn’t made to incorporate the original cause in the wider movement. An efficient and effective PA could have been set up and the speakers could have addressed the whole of the crowd that had assembled. Then together the expanded group could have marched to the Congress. 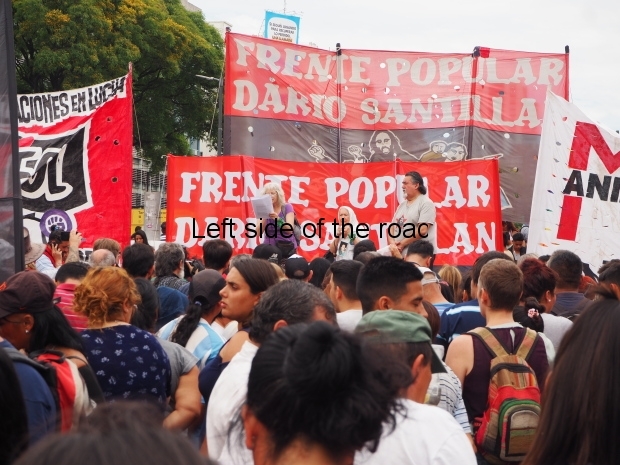 Nothing will change based on either of those two events but it would have been a move forward to unite all the grievances of the people against the ruling class of Argentina and the world. 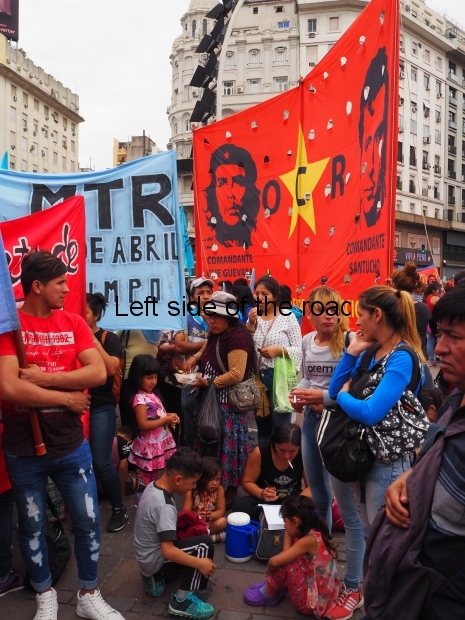 This entry was posted in Argentina, Travel and tagged barrio, buenos aires, demonstration, injustice, manifestation, neighbourhood, socialism, unemployment, workers by Michael. Bookmark the permalink.